My Crème de la Mer: Here today, gone tomorrow! The $45 limited edition Introductory Collection La Mer gift-with-purchase set sold out like hot cakes! As an introductory collection with an elegant travel case it included smaller sizes of The Moisturizing Cream, The Eye Balm Intense, The Radiant Serum and The Reparative Body Lotion. 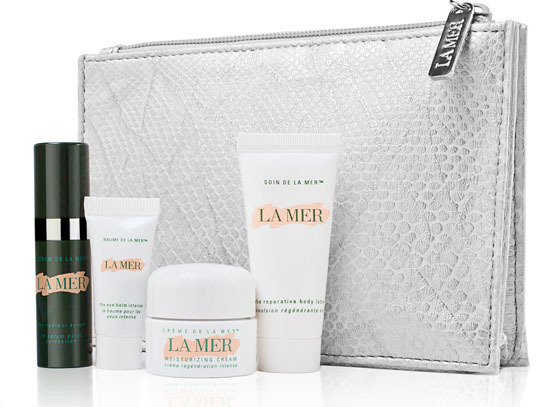 It created a bit of a buzz on Twitter when La Mer removed this offer from their Facebook page. I got the Moisturizing soft cream instead of the Moisturizing cream and the hand cream instead of The Reparative Body Lotion. Would have preferred the items in the post.